SALINAS, CA (June 28, 2017) – Church Brothers Farms, a leading grower-owned processor/shipper of a full line of fresh vegetables with an in-house farming/harvest program, unveiled today its Clean Power Station, a cogeneration system, as part of the 2017 Forbes AgTech Summit field tour at the True Leaf Farms processing plant in San Juan Bautista, Calif. Cogeneration, also known as cogen or Combined Heat and Power (CHP), is the production of electricity and heat from a single fuel source. Powered by a natural gas fueled engine, a cogeneration system is a highly efficient way of capturing heat that would otherwise be lost during the production of electricity. At Church Brothers Farms, the cogeneration plant has an additional step where thermal energy (heat) becomes cold with the use of an aqueous ammonia absorption chiller. As a result, the plant will generate 2MW of electric power to run the state of the art processing facility while recovering enough heat to provide 300 tons of low temperature refrigeration. 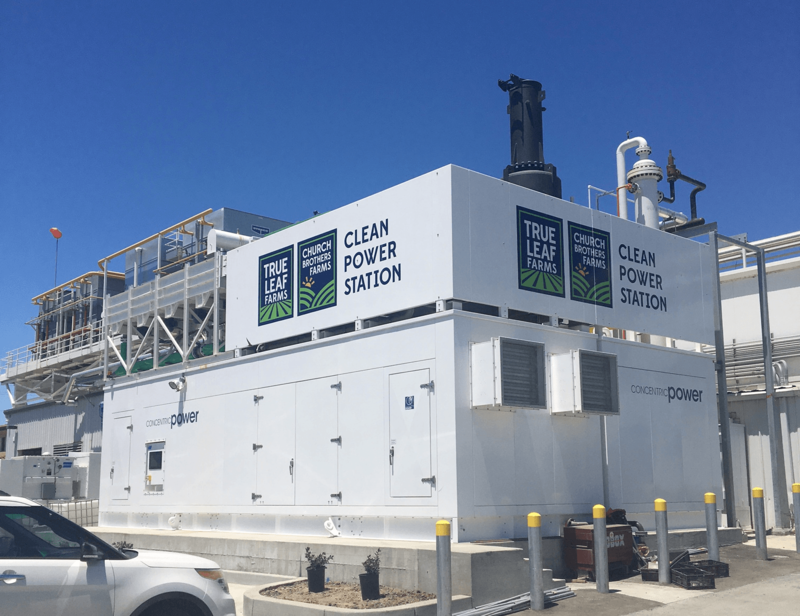 The Clean Power Station at True Leaf Farms was created in partnership with Concentric Power, based in Campbell, Calif. Concentric Power creates high-efficiency energy modules for onsite electric power generation and low temperature refrigeration. Tom and Steve Church, co-chairmen of Church Brothers Farms, are investors in Concentric Power. The first-of-its-kind technology uniquely has the ability to tie directly into existing refrigeration systems and capture heat that would otherwise be lost during the production of electricity. This provides a clean energy solution most efficiently and directly to the host facility while also creating significant economical savings and increases in long-term sustainability. 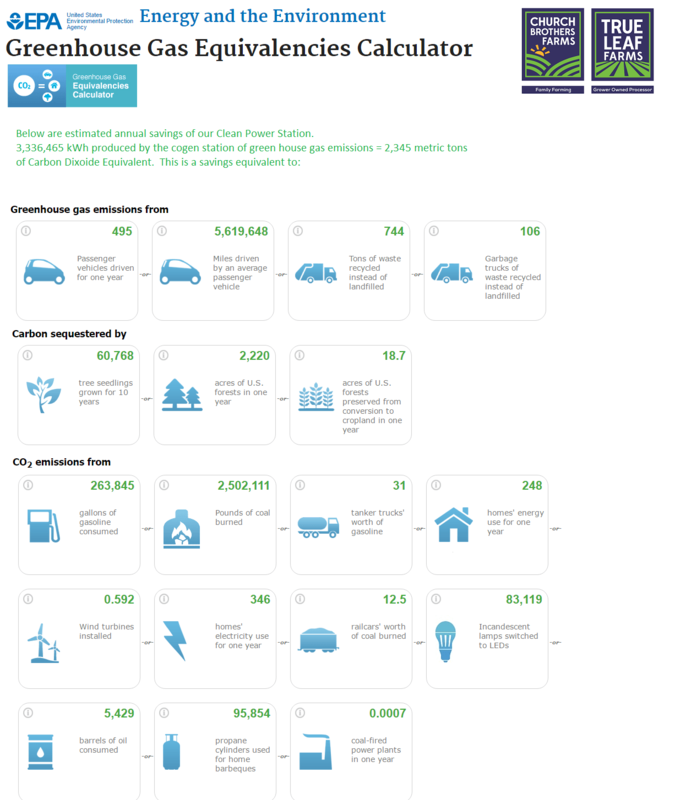 When fully operational, the cogen system at the True Leaf Farms processing facility will reduce the company’s carbon emissions by 25 percent and allow the company to return power back into the grid. A cogen system is more controllable, enabling True Leaf Farms to control when it’s on or off, unlike solar or wind power. Concentric Power’s patented control system adds a smart software layer that maximizes technical efficiencies and economic results. For more information, visit ChurchBrothers.com or ConcentricPower.com. 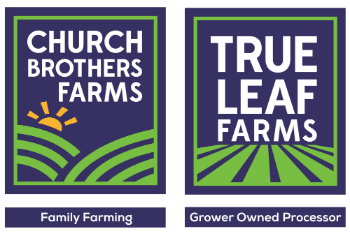 Church Brothers Farms is a vertically-integrated family owned and operated company that produces a full line of fresh vegetables year round with an in-house farming/harvesting program and state of the art processing plant, True Leaf Farms. We are a grower-owned processor, farming the majority of our raw product ourselves; adhering to industry-leading food safety and quality standards. The Church family has a legacy of service and innovation; we deliver produce with passion. Concentric Power, based in Campbell, Calif. and founded in 2010, creates high-efficiency energy modules for onsite electric power generation and low temperature refrigeration. By combining electric power and thermal energy at the same time, Concentric Power captures heat that would otherwise be lost during the production of electricity and instead provides a clean energy solution. Concentric Power’s “power plant as a product” delivers the most energy efficient method today for agriculture and industrial sectors seeking an economical, efficient energy solution. Concentric Power joined the Western Growers Center for Innovation & Technology as one of its inaugural residents and believes collaboration with other startups and leaders is essential to industry growth. CEO and founder Brian Curtis is a Salinas, Calif. native and an active advisor to the Department of Energy’s Office of Energy Efficiency and Renewable Energy.